In our commercial, profit-oriented world, it is counter to reason that free products continue to see speedy development. But that is the fact with web browsers. Microsoft offers MS Edge (and formerly offered Internet Explorer). Google has Chrome. Apple has Safari. Firefox is open source and is offered by the Mozilla Foundation. And there are others as well. All of these companies feel the need to offer free, competitive browsers in order to maintain their ecosystems and customer base. Because of this competition, the advancement of browsers is rapid and there is a synergistic process of browsers offering new technologies to serve companies pushing the envelope in browser capability – including HTML5, video, form entry, and other forms of interaction to and from websites. Because browsers are free, every computer, tablet and (most) mobile devices have them, opening up a huge market for companies, universities, government institutions and others who want to use the simplicity and availability of browsers for their customer interactions versus installed applications. This competition also quickly obsoletes old browsers. The competition is so fierce and so important that Microsoft Internet Explorer, which long ago had major market share because it was shipped free with Windows, was sent out to pasture in 2015 by Microsoft. The old product’s code base, which had a lot of loyalty, became incapable of supplying modern browser demands. Microsoft Edge was introduced in 2015 with a significantly new code base and IE 11 was labeled a “legacy” browser for users dependent on the old technology. However, even Microsoft urged customers to move to Edge because of new features and much better performance. Snowbound– through its VirtualViewer® for HTML5— offers our many enterprise, OEM and governmental customers browser-based technology that makes it easier for their users to access and interact with their content on the web. Eliminating application installation on their users’ computer systems dramatically reduces customer support burdens and increases customer satisfaction through much more rapid feature and quality updates. With each new version of browser technology, more capabilities are added and greater functionality is available to serve customers’ needs. The reason Microsoft put IE 11 out to pasture in 2015 was because they realized the product could no longer be made useful for modern-day web applications. Though browser upgrades are free, many enterprises dread the effort and possible user confusion of making the change. Internet Explorer, in particular, is more problematic than other old browsers because of its very large historic customer base, including many large companies, however with limited functionality, acknowledged poor web security and uncompetitive performance, it has become dangerous to use for corporate business on the open web. Changing to more modern browsers will inflict some pain in the short term, however there is no questioning that it is time…. Below are some browser benchmarks regularly conducted by Digital Trends. In 2018, they no longer even bother benchmarking IE 11 or older versions of IE. They concluded that the product is not viable for today’s needs. The article reached by the link below explains why. Occasionally we hear from customers using IE that working with their web-based applications is too slow. There is an explanation and an “easy” solution. Don’t blame the application, blame Internet Explorer. Microsoft and Digital Trends will agree with you. Note that Chrome and Opera are the currently best browsers in HTML5 support but the worst (Firefox and Edge) are not that far behind. Of course, if you’re dependent upon a particular HMTL5 feature, it is critical which browser is chosen. In this benchmark, IE 11 is not measured because it is considered too old for consideration and is no longer shipped with the latest Windows version. 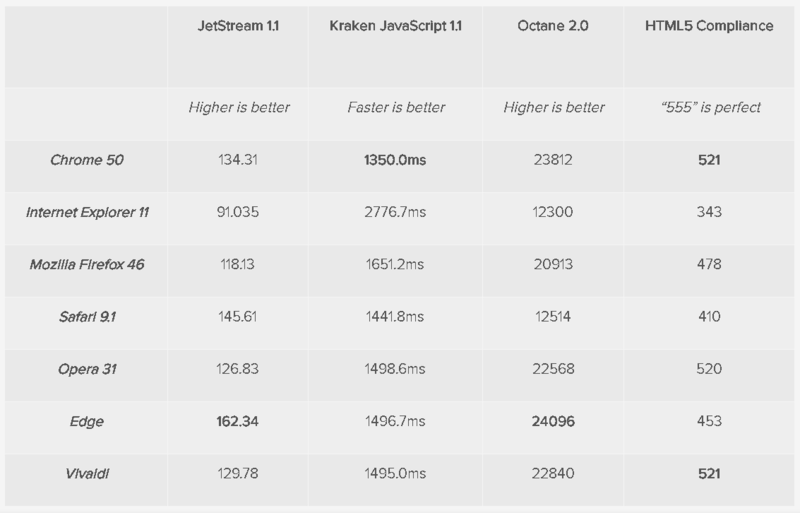 Given many enterprises are still using IE, I think it is instructive to discuss how IE 11 has been benchmarked. In 2016, Digital Trends measured a similar set of browsers but older versions. Internet Explorer 11 results are so slow it doesn’t run with the pack.